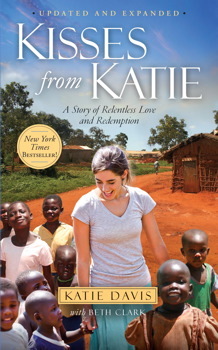 This past week, I read Kisses from Katie: A Story of Relentless Love and Redemption and absolutely loved it! Such a heartwarming story of how one ordinary person can follow God's call and make such a difference. I enjoyed this book because I could relate to Katie. She grew up in an upper-middle class, Christian family. Her parents taught her the same values and placed the same expectations upon her as mine did me. But starting in her senior year of high school, Katie was able to step beyond her parents plan and begin to follow the call she felt from God. During her senior year, she volunteered at an orphanage in Uganda. After that, she went back for a year to teach kindergarten. She had promised her parents that she would return after a year to go to college. But during that year, things changed. Katie began to adopt orphaned girls and she began to feed children and help sick people obtain the medical care they needed. She did honor her parents' wishes to return for college, but only for a semester. The time back in the states was so hard for her and she missed her daughters terribly. But that time back did allow her to raise money for her non-profit organization, Amazima. She returned even more committed to the work she was doing there and with a resolve that Uganda really was home now. "Adoption is a redemptive response to tragedy that happens in the broken world. And every single day, it is worth it, because adoption is God's heart. His Word says, 'In love he predestined us to be adopted as his sons through Jesus Christ, in accordance with his pleasure and will' (Ephesians 1:5). He sets the lonely in families (see Psalm 68:6). The first word that appears when I look up adoption in the dictionary is 'acceptance'. God accepts me, adores me even, just as I am. He wants me to accept those without families into my own. Adoption is the reason I can come before God's throne and beg Him for mercy, because He predestined me to be adopted as His child through Jesus Christ, in accordance with his pleasure and will - to the praise of his glorious grace. My family, adopting these children, it is not optional. It is not my good deed for the day; it is not what I am doing to 'help out these poor kids.' I adopt because God commands me to care for the orphans and the widows in their distress. I adopt because Jesus says that to whom much has been given, much will be demanded (see Luke 12:48) and because whoever finds his life will lose it but whoever loses his life for His sake will find it (see Matthew 10:39)." "When it is one of my children, there is a bit more urgency, a bit more panic.... I am not proud of this. I have held several children as the died of inadequate medical care. It was horrible and I grieved, but I promise you that I wasn't as devastated as I would have been had it been one of my own daughters. It's ugly, but it's true. It's just different when it's your child who's suffering. But should it be? This is what I have been struggling with. I believe that this is a normal human reaction. I also believe that it is wrong. I believe that every human being on this planet is God's child, perfectly made and beloved and cherished by Him. I believe that His heart hurts, even more than mine does when my baby is hurting, for each and every one of the hurting, dying, starving, crying children in our world. So I have to believe that if my heart was truly seeking to be aligned with the heart of God, that I would hurt for each of these children as well." Although the tone of her book and her message is uplifting, she doesn't shy away from painting a very real picture of the grim conditions in Uganda. It's heartbreaking and heartwarming all at once. I'd encourage you to check out the book and consider supporting the work that Katie is doing. You can find out more at the website of her non-profit, Amazima. Also on that website is a store where you can buy handmade necklaces. These necklaces are made from recycled paper by women in Amazima's vocation program where they learn how to support their family and save money. I'd love to get one in blue for my birthday (hint, hint!). And be sure to check out other good books @ Housewifespice! Sounds like a great read for Lent....sacrificial love. What would your opinion be of reading this aloud to 12 and 14 yr old girls? Ok or a little too much reality for that age group? I think it would be appropriate for this age group. I think Katie does a good job of presenting the reality in a way that is not gruesome - there is real suffering, but there is always something that can be done and she emphasizes the good that can come out of everything. I would encourage you to do the read aloud! Yes, Mrs. C read my mind. Good Lenten reading and reflection. I love her definition of adoption as God's heart. Thank you!